Although we have never met, you seem familiar to me. I follow all your upbeat reports on Twitter about the bright future of European rail, and your great liberalisation plans, and investments in trans-European networks. Well Siim, for me as a traveller, I’m not feeling it. I am actually one of those people you are supposed to be trying to promote: a cross border rail traveller. So every time from now on that I cross a border on a train and it goes wrong, I’ll be sending you a virtual postcard to let you know what happened. I somehow suspect you will be getting a few of these from me. Call it reports from ‘real life’ if you wish. So Siim, today I am writing to you from Hendaye, on the border between France and Spain. 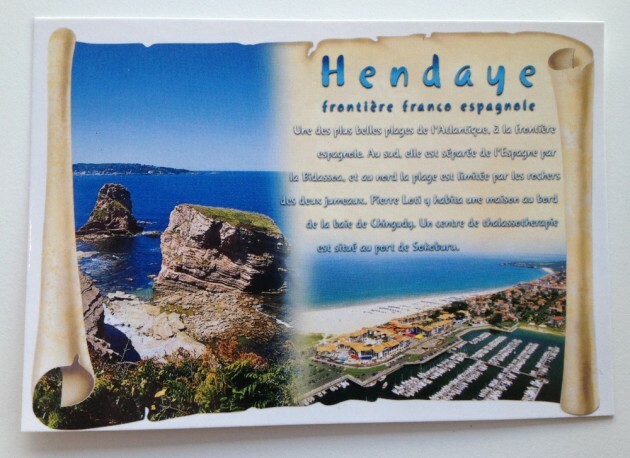 I have time to write to you because I am not actually meant to be in Hendaye. But thanks to SNCF I am stranded here for more than three hours. You see RENFE actually did a good job, getting me from Madrid to Hendaye on time. At 1351 local time. The problem is that there are engineering works north of here, so we need to take a bus, and SNCF choose to put the first rail replacement bus service on at… 1715. Here waiting with me is an elderly Spanish lady, on the way to visit her son in Paris. I tried to help her, because I am that sort. She is going to be waiting around a draughty station for this time, and will eventually get to Paris at almost midnight. Yes, it might sound hard to believe, but there are no replacement buses between 1215 and 1715, and the train from Madrid arrives at 1351. How does that make you feel, Siim? Could you look the old Spanish lady in the eye and tell her that EU-wide railway travel works? Try to justify to her why RENFE had not told her that there would be no connecting service in Hendaye? Or explain the brusqueness of the SNCF ticket office staff, telling her to just speak to the non-existent station manager to get a justification for the poor timetabling? Because you know what will happen next time Siim: she will fly. Is that right? Anyway, until the next time, travel safely. * Siim Kallas is the European Commissioner for Transport. More about him here, and on Twitter here. I did write this in Hendaye, but am now uploading it in Bayonne. Little did I know the chaos that would then follow. The 1715 bus was of course packed, so 5 passengers were turfed off and had to wait for the next bus. The bus driver then got lost leaving Hendaye, and had to ask passengers for assistance. Then the bus got stuck in traffic, so the driver started to drive like a maniac, and almost knocked down a man on a pedestrian crossing when arriving into Bayonne. Of course no-one had thought of the timetable – a 1715 bus departure from Hendaye is just too tight to be sure to get the 1827 connecting TGV to Paris, especially when traffic is heavy. So the TGV actually had to wait in Bayonne for the bus, and all the passengers – including the elderly Spanish lady mentioned above – had to rush for the train. The SNCF staff at Bayonne of course just stood there, even after I suggested to one that he should help unload the bags from the bus. I some of it instead. I then complained to another member of staff that the arrangements were inadequate, and that there should be more buses, and one at least 30 minutes earlier. “Mais le weekend il n’y a plus de trains que ça!” Well, no, actually, that’s a lie, SNCF man. 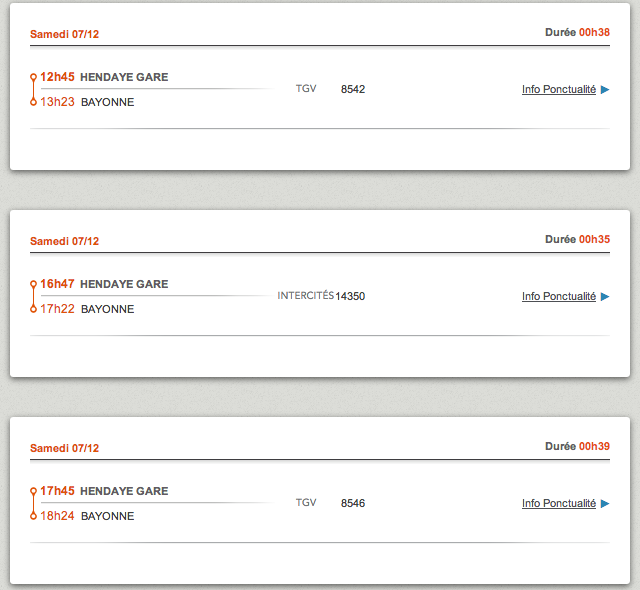 Here are the trains for next Saturday – there is at least a 1627 departure from Hendaye, and that was not covered by a bus. The clear message here: just don’t even try to go this way by train at a weekend, even if the trains work… And this is one of two routes in and out of Spain. I despair. Worse still are the narrow non-connections in Irún such as 09:22 arrival from Paris and 08:45 departure to A Coruna and Vigo. And beat this: 13:51 arrival in Hendaye from Madrid (with connection from Barcelona in Irún), but 13:43 onward departure to Toulouse! Oh hang on, I can. The overnight train from Madrid to Barcelona (yes, it still runs), arrives 5 minutes after the 07:00 departure to Latour de Carol. Senseless. Prussia: UK train fares are only expensive if travelling without pre-booking in the morning and evening weekday peaks. Practically the only people who ever do this are business travellers. The rest of the time you can use Off-peak walk-up fares, which compare reasonably well with turn-up-and-go fares in other European countries. It is doubtful if it is ever cheaper to travel from London to Germany than to the north of England. Eurostar ‘flexible’ standard-class fares are at a similar price-point to Anytime UK long-distance fares, except that they are not fully flexible (you still have to pay about £30 to change your ticket) and there is no cheaper flexible fare (e.g. equivalent to Off-peak on UK national rail): the ONLY way to get a cheap Eurostar fare is by booking a non-exchangeable non-refundable ticket in advance. The cheapest Advance fare from London to, say, Manchester is £12.50. This compared with “from £39” one-way Eurostar fares, and unlike these, UK National Rail Advance tickets can be changed (for a fee). sjgakljglajls: At least there is a frequent train service between Malmö and Copenhagen. The local cross-border rail link between the UK and France is non-existent. I don’t mean Eurostar, linking the capitals, but an inter-regional link between southern Kent and Nord-Pas-de-Calais. I think there are NO passenger trains stopping at both Ashford International and Calais-Fréthun towards France, and only one a day in the other direction. And since the fare is the same as that between London and Paris/Brussels, it would be hardly worth using anyway. Therefore, it is very difficult to travel by train from the UK to northern France (except Lille) avoiding Paris, or from France to Kent avoiding London. Blame this situation mainly on the UK not being in Schengen and the ridiculous security theatre, but also Eurostar has openly stated that it considers itself to be an ‘airline on rails’ rather than a ‘proper’ rail service, so believes that people travelling between capitals are the only ones who matter. A proper inter-regional rail link between the UK and France would make car-free travel between the two countries much easier than it is now, especially if through ticketing were properly arranged. Hendaye! This station reminds me about one of my best flirts with SNCF. It was 2010 and there was a convenient Lunéa night train from Hendaye to Geneva, but it was not possible to book it online. I was told by the SNCF customer office that they were not opening it for reservation because the schedule may slightly change (N.B. it was the Sunday night train on the Hendaye-Toulouse-Lyon-Geneva line, i.e. a very popular connection between Southwestern and Southeastern France). When I finally went to the Hendaye ticket counter, I was told that the train was cancelled, meaning that I had to cancel a whole day in San Sebastián and leave in the early morning to catch a snail train via the Massif Central (very interesting route, if you have a lot of time, by the way). Jon, why don’t you open a page to denounce the absurdities of cross-border train services as you did for non-compliant ID checks within the Schengen area? It took more than twenty years to connect Spain with France via Catalonia through high speed (the first high speed line in Spain dates back to 1992), so it is clear that cross-border connections were never a priority. The line has been finished for longer than the article says, but both Spanish and French companies have been dragging their feet. So this looks like yet another example -such as energy or telephone commodities- of former state-owned monopolies doing all they can to resist integration and keep their markets captive, in this case with phony technical pretexts. I’m constantly having border crossing problems between Sweden and Denmark. I often have to change trains on both sides of the border, using a local train between Malmö and Copenhagen. Also, it tends to be a lot cheaper to use two or three tickets instead of one. If I only need to change trains once (in Copenhagen), then I get one ticket from Stockholm to Copenhagen and another ticket from Copenhagen to Funen or Jutland. If I need to change trains twice (in Malmö and Copenhagen), then I get three tickets: Stockholm-Malmö (bought at http://www.sj.se), Malmö-Copenhagen (bought in the vending machine at the station) and Copenhagen-Funen/Jutland (bought at http://www.dsb.dk). Border crossings are so unnecessarily complex. It is nice to hear rail rants from somewhere other than the UK! I have just resigned myself to the fact that British trains are rubbish and expensive. Though they were not so much more superb before privatisation. But still, am sorry for your chaotic journey – these things are not pleasant. I am still eagerly waiting for news on the long publicised, yet to materialise ICE train for high speed trains from London to Berlin. Though am sure if it does materialise it will still be quicker and cheaper for me to travel to Germany from London than to get up North from London. Bizarre! Oh Jon, don’t even get me started on this… Connections between Portugal and Spain are awful and just broken and completely illogical, it’s not even a metter of investment, it’s just stupid! But most shocking was getting to Brussels and realising connections to other countries are also bad. What about Benelux? There’s only 2 train connections between Netherlands and Belgium, even though in Eindhoven they’re not far from both borders. But the highlight is between France and Belgium. A Belgian train goes right to the border in Erquelinnes and 2km away in Jeumont it is the start of a French line. Just 2km more and a deprived area in North France would be easily accessable from Brussels, where there’s plenty of people with money looking for quiet places for a rest. I think it’s really poor this broken logic. Renato – thanks for the comment! I wasn’t aware of this Erquelinnes and Jeumont case, so thanks for pointing it out. I am also aware of many equivalent headaches – FR-IT at both Modane and Ventimiglia, IT-AT at Tarvisio, IT-SI from Venice… Just today something broke, and I felt I had to start documenting these absurdities more thoroughly. If you would like to contribute postcards from borders you cross then do let me know!